If you have been arrested or are being investigated for burglary in Maryland do not gamble with your future! It is a serious crime, and in many cases is charged as a felony. In addition an arrest for may result in your DNA being collected and kept by law enforcement forever. The Herbst Firm knows the ins and outs of this crime, and will fight at all costs to keep you out of jail, and off probation. Under state law, burglary is broken down into four different degrees ranging from misdemeanor fourth degree to felony first degree. The crime is traditionally defined as breaking and entering a building, structure, or conveyance with the intent to commit a crime therein. As is the case with most traditional legal terms, the definition of the crime has evolved. One part of the traditional language in the state law that has remained intact is the requirement that there be a breaking and entering. The term entering is self explanatory but the term breaking is not as obvious. A defendant accused of burglary does not actually have to break anything including a window, door, or lock. Breaking simply means crossing an imaginary line where the building, structure, or conveyance begins. In reality breaking is almost synonymous with entering but implies a lack of permission to enter, and the two terms are still written in the law together. The traditional term dwelling is still used but it basically means any structure that is used as a home. Fourth degree burglary is the lowest level of the crime, but it still carries a maximum prison sentence of up to 3 years. Along with breaking and entering a motor vehicle it is one of two types that can be classified as a misdemeanor. The definition can be quite confusing. It is defined as either breaking and entering a dwelling or breaking and entering a storehouse. It also includes being in or on the yard of a dwelling or storehouse with the intent to commit a theft or while possessing a burglary tool. In other words, simply breaking and entering a dwelling or store will result in a fourth degree charge without the government having to prove intent to commit a crime. First, second, and third degree burglary may be less complex to define, but all three are felonies. Third degree occurs when a defendant is charged with breaking and entering the dwelling of another with the intent to commit a crime. This act carries a maximum sentence of 10 years imprisonment. Second degree carries a maximum 15 year sentence, and is typically charged when a defendant is accused of breaking and entering a commercial place like a store or restaurant to commit a crime such as theft. If a defendant is accused of breaking and entering a storehouse to steal a firearm then that defendant faces up to 20 years imprisonment. 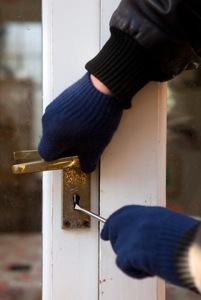 First degree burglary occurs when a defendant is accused of breaking and entering a home with the intent to commit theft or a crime of violence. This crime is often known as a home invasion robbery, and carries a maximum sentence of 20 years in prison. Other specific types of burglary that are not classified by specific degrees include breaking and entering of a motor vehicle and burglary by destructive device. The breaking and entering of a motor vehicle law makes it a misdemeanor punishable by 3 years imprisonment to commit a theft of an actual motor vehicle, or to steal anything located inside a car. Destructive device crimes can be charged if a defendant uses an explosive to open or attempt to open a safe or a vault. This crime has a maximum sentence of 20 years in prison and can be charged separately with another count of first, second, or third degree burglary. The sentences of these two crimes do not have to run concurrently. In other words a defendant who breaks and enters into a persons home and then uses a destructive device to open a safe within the home can face up to 40 years in prison on two separate felonies. If you or someone you know is being investigated or has been charged with any crime, call the Baltimore criminal lawyers at The Herbst Firm for a free consultation. We are willing to travel to meet you anywhere in the state to discuss your case.